Headlee and Joseph (1945), Rosenfeld (1954), and Dressel (1985) provided data regarding Oriskany formation-water salinity. 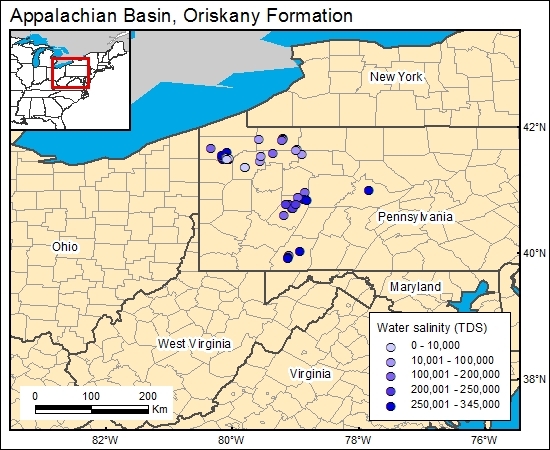 Dressel (1985) reported that total dissolved solids (TDS) in Oriskany brines of northwestern and west-central Pennsylvania range from 9,990 to 343,000 mg/L. Headlee and Joseph (1945) reported brine-salt content at 250,00 mg/L in western West Virginia. For the GIS, we put the range of 9,900 to 343,000 mg/L. Dressel, P. E., 1985, The geochemistry of oilfield brines from western Pennsylvania: Pennsylvania State University, Master's thesis, 128 p.
Headlee, A. J. W., and Joseph, J. S., 1945, Permeability, porosity, and water content of natural gas reservoirs, Kanawha-Jackson and Campbells Creek Oriskany fields: West Virginia Geological Survey Bulletin No. 8, 16 p. Dressel, P. E., 1985, The geochemistry of oilfield brines from western Pennsylvania: Pennsylvania State University, Master's thesis, 128 p.
Rosenfeld, M. A., 1954, Petrographic variation in the Oriskany Sandstone: American Association of Petroleum Geologists Bulletin, v. 65, p. 1298-1299.